Melts away muscle tension and fatigue. 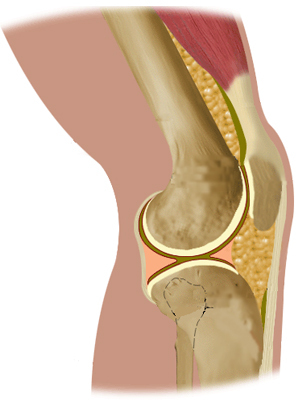 Our knees take on a great deal of trauma which can lead to serious pain and discomfort. Our Heated Knee Wrap helps to soothe the pain and increase blood flow without the use of potentially harmful medicines. If you are ready for relief, you are ready to experience the benefits that our Heated Knee wrap has to offer. Our system delivers therapeutic and targeted heat directly to your muscles and tissues where you need it most. Regain your mobility and active lifestyle again with the At-Home Heated Knee Wrap. Click here for more info. 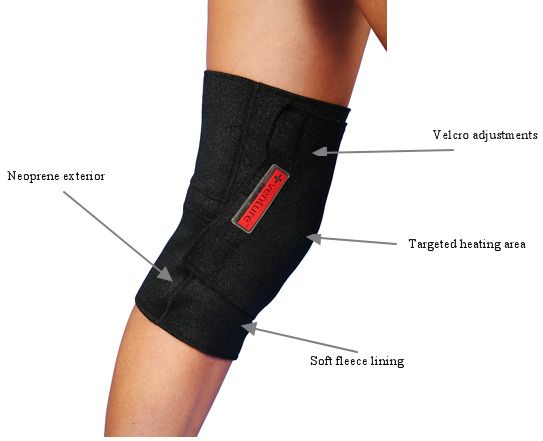 3D tailored and anatomically designed garment positioned directly on the elbow back area to fully relax tense muscles, ligaments, and tendons. Solution for symptoms that cause knee pain and discomfort. As you already know, our body's natural reaction to acute pain is to tighten up and resist movement to prevent further injury. This defense mechanism usually causes prolonged muscle tension resulting in lingering chronic pain. Our FIR Heat Therapy Wrap relaxes your muscles, tendons, and ligaments with soothing heat to increase your flexibility and blood circulation thereby relieving the sensation of pain. F.I.R. Technology transforms light energy emitted by the sun into therapeutic heat energy that stimulates the body's natural healing capabilities and lymphatic movements to get rid of toxins and oxidative stress. Heat therapy is the most recommended non-invasive, non-pharmaceutical form of pain relief and rehabilitation by physical therapists and medical professionals alike. The revolutionary design brings the power of Far Infrared lamps seen at the doctor's office into the convenience of your home! Our heat therapy products are low-voltage and produce virtually no electromagnetic fields (EMF) for your safety. 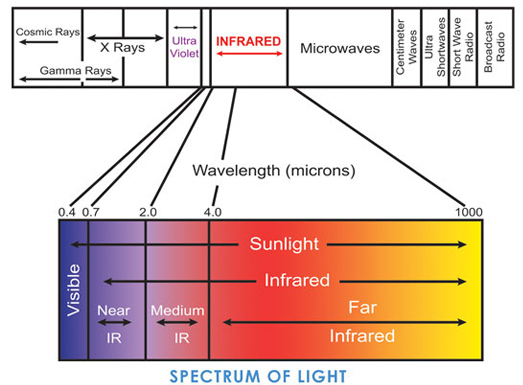 Produced naturally by the Sun, Far Infrared Rays (FIR) are wavelengths of energy found within the light spectrum but invisible to the naked eye. Through a process known as "thermal conversion", these rays allow the warmth from the Sun to penetrate deep into the human body and gently elevate its temperature which has been shown to be a beneficial to the physiological well-being. Unlike conventional forms of heat therapy products, which heat up only the surface of the skin, Far Infrared Ray heat penetrates up to 3 inches into the muscles and bones, optimizing its therapeutic benefits. In addition, FIRs superior heating efficiency enables users to use a lower overall heating temperature, perfect for sensitive individuals. Our At-Home Heat Therapy Back Wrap uses a built-in low voltage plug that connects easily to any outlet in your home or office. The simple temperature control interface allows you to have heat on demand and to select between 4 different heat settings with the touch of a button. Knee 12" to 18" 18" to 23"
1. What are Far Infrared Rays? Produced naturally by the sun, Far Infrared Rays (FIR) are wavelengths of energy found within the light spectrum but invisible to the naked eye. Through a process known as “thermal conversion”, these rays allow warmth from the Sun to penetrate deeply into the human body and gently elevate its temperature for pain relief effects. 2. What are the benefits of Far Infrared Rays used in FIRheat wraps? Far Infrared Rays are a subject of scientific studies because of its many benefits. Its deep penetrating heat causes capillaries to dilate which increases blood flow and heightens the blood’s oxygen level. The soothing warmth relaxes muscle spasms and loosens joint stiffness. It speeds up cellular healing and helps eliminate harmful toxins. 3. What makes FIRheat products different from other heat therapy systems in the market? 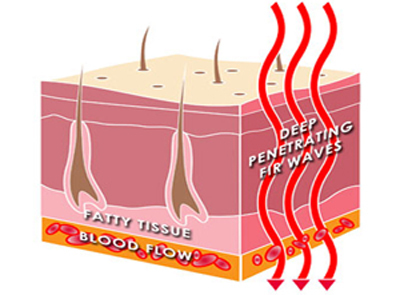 Unlike conventional heat therapy products that only heat up the skin’s surface, FIRheat’s Far Infrared Ray emitting wraps produce heat that penetrates into the muscles. This activates the body’s natural healing process and gently elevates the body’s temperature. This is known to be an effective pain management modality. In addition, its carbon-fiber heating element heats evenly, greatly minimizing the risk of burns. 4. Are FIRheat wraps safe? High voltage, conventional heat therapy presents high levels of electromagnetic field frequencies (EMF) which can be detrimental to the health. 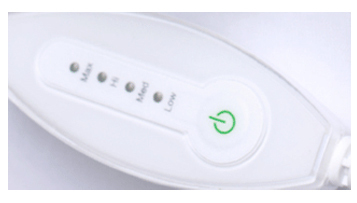 FIRheat therapy wraps are safe because the product is low voltage and produces virtually no EMF. It is also equipped with other precautionary features such as a 30-minute automatic shut off, 4-setting temperature controller and LED status indicator. 5. How does the product work? 1)— Wrap the FIR product around the aching body part. 2)— Adjust the fit by using the Velcro lock until it is snug and comfortable. 3)— Choose the heat setting that works best for you using the 4-temperature controller. 4)— Enjoy your 30-minute FIR heat therapy session. 5)— The therapy wrap automatically shuts off after the 30-minute session.